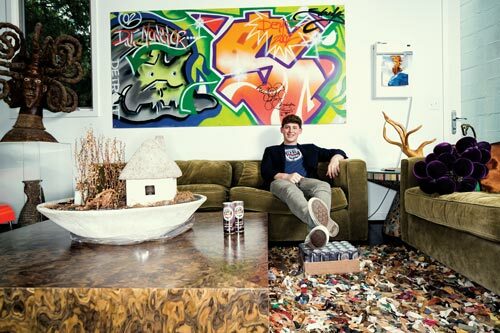 Young CEO of the Year hopes new energy drink adds sparkle to the city. What began as a project for a high school business class nearly three years ago has become a thriving commercial enterprise that’s also contributing to the revitalization of Detroit. 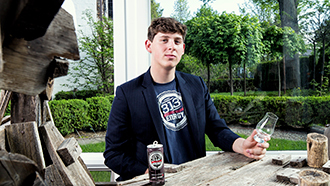 The company, 313 Energy, was launched when Sawyer Altman and Matthew Tuckle, then sophomores at Frankel Jewish Academy in West Bloomfield Township, were looking for an idea to sell something they thought every student would want. The idea of developing a new energy drink caught on, and the duo started and ran the company for several years before heading to college. Sawyer’s younger brother, Carter Altman — who will be a senior at the academy this fall — took over running the business last year. Now, Carter, who turned 17 in June, has been named “Young CEO of the Year” for 2015 by DBusiness magazine based on reader nominations. Carter says that, like many new ventures, the first attempt wasn’t necessarily the best. The original idea was to sell a drink called 313 Water, and the plan called for bottling water from the Detroit River and “selling it around the world.” Carter says the river water is clean, however, early testing of the product with potential customers drew a negative response. “No one wanted to drink river water,” he says. The all-natural drink originally had two flavors, regular and sugar-free. “It was more of a generic energy drink flavor, but we wanted to change to something unique and healthier to better represent our city,” Carter explains. He says they decided to offer one flavor: light cherry. Today, the energy drink has five grams of natural cane sugar, all-natural caffeine, and is 20 calories per 8.4 ounces per can. What’s more, “313 Energy is a brand about giving back. It’s something that every Detroiter should be able to support because, every time they do, they’re supporting their own city — and that’s something that’s really important right now with the movement to revitalize the city,” he says. Carter adds for every can the company sells, they donate 11 cents to the Detroit Public Schools Foundation.